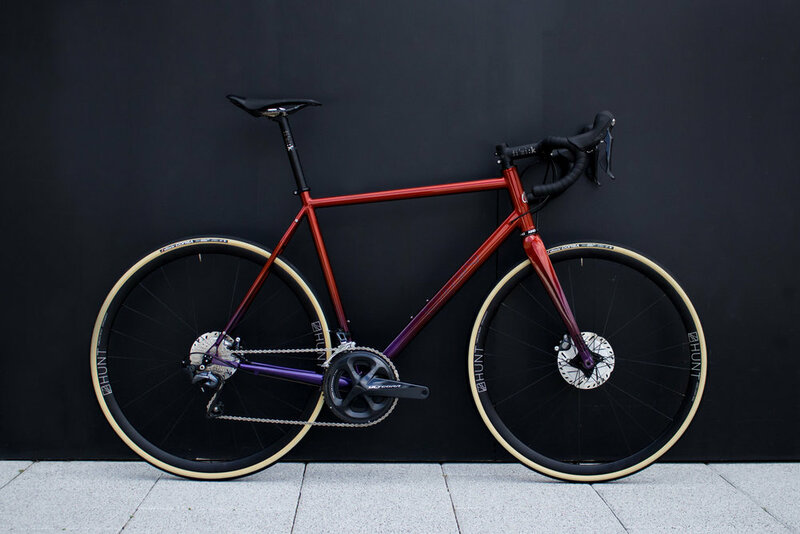 Rob's All-Road Candy Dream — Quirk Cycles | Custom Steel Bicycles Handmade in London by Framebuilder Rob Quirk. Every so often a customer comes along who knows exactly what he wants and wastes not time getting their dream bike built. Rob was one such customer and I think we can all agree what Rob envisage was truly beautiful. Built around our All-Road model using custom geometry for the best fit and balance we focussed on designing the frame to be an equal split between endurance and performance. Using a mix of our favourite Columbus tubes of HSS for it’s excellent ride quality and Life for superb rear end comfort and stiffness, Rob was keen to keep all the cables internally routed for the cleanest possible finish and to best show off the paint. The paint here is the headline act utilising the amazing deep lustre that can be achieved with House of Kolor Candy base paints. Orange and blue is a classic combination and we knew they would fade into one another perfectly but had no idea how stunning the range of hues that would result. Once again the finish was perfectly executed by Cole Coatings Workshop.